So, a week ago last Tuesday, my air conditioning was repaired — a little over four days after it went out. I met the repairman that day — he arrived a little earlier than the two to five o’clock time period I was given. Before three o’clock, he was done and advised me it would take a few hours to cool the house back down — it was indeed 96F in the house. I checked my vents and confirmed that cool air was creeping back in — I was still breaking out in a sweat. Too late to return to work and not really wanting to wander around shopping, it occurred to me — the Blessed Sacrament chapel in my parish — that’s a cool place. I grabbed my Liturgy of the Hours, my rosary, and a couple of books. I made the short 6 mile trip — it was even cooler in my car. Once inside the chapel, I challenged myself to take my own advice. I had shared with a group that, to really listen for God’s voice, try going to adoration without anything in your hand. I decided to sit there quietly. I was reminded of another cool Jesus moment — literally cool. A few years ago, my Secular Franciscan fraternity was asked to assist with the Atlanta Steubenville Youth retreat. It was held at Georgia’s FHA camp and had a beautiful chapel on site. One of our fraternity volunteered to set up the adoration chapel and I volunteered to keep the sign-up sheet for guardians. The wee hours of morning from one-thirty to five were a little sketchy. I was assigned to sleep in a room on the floor with other volunteers. I was glad to have my air mattress — until I realized I’d forgotten the plug that would keep it inflated. I was having a fitful time — too warm and hard floor. I had seen that there were a couple of hours without a guardian. I grabbed up my pillow and sleeping bag and headed to the chapel. It was a blast of cold air like opening the freezer door — it was heaven. 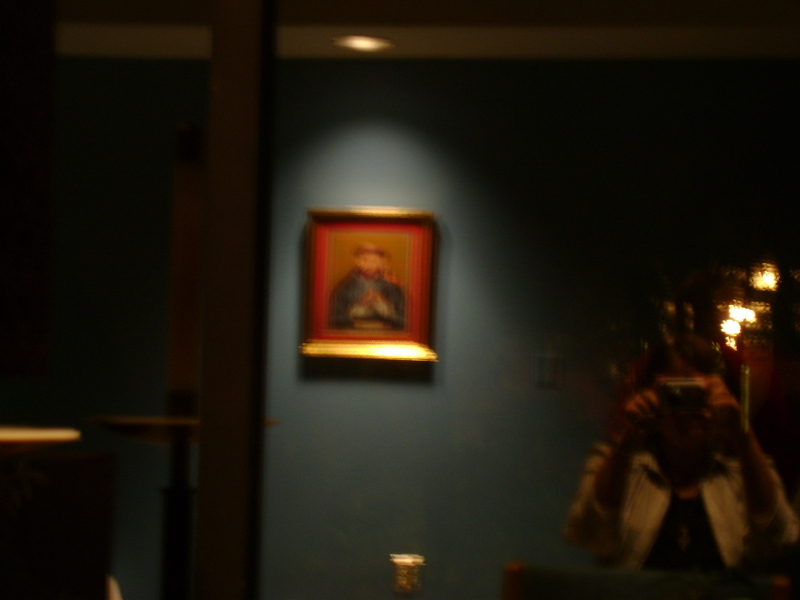 I curled up on a pew and tried my best — the idea is to be awake — I was never alone in the chapel. Another friend had joined me and there was usually one or two others. I did doze. Lightning never struck me for dozing but it was blissful and the dreams I had were for me alone. I am reminded of this time as I sit here in the Blessed Sacrament chapel — waiting for my home to cool down. I sat silently and was spoken too — I did take notes so as not to forget. I joined Evening Prayer and then went home after being gone for three hours. My home was 86F and the humidity was gone. I was many times better than when I left. All that to be reminded that Jesus is cool. I guess I am making this a Rich Mullins trilogy. This is another favorite song. Whenever I hear this music, I am taken immediately to adoration of the Eucharist. My mind can travel right to the monstrance, or, I can bring to mind the procession of the monstrance at our Eucharistic Congress. The video below is a live version from a concert. In fact, it follows the other live video that I posted in I Belive What I Believe. This version is a little ‘unplugged’ compared to the CD — begins a little out of sync — comes together and builds. The version I listen to in my car — well — I turn it up loud with slightly more bass. The bass brings out the drums and this is why I also think of the Eucharistic procession. Reflection on the readings for the Second Sunday of Ordinary Time — USCCB (NAB) Reference The selected OCIA theme of the day is that of Vocation. Sharing some of the reflecting and note taking I did in preparation for OCIA. In the first reading, we have Samuel who was called by God in his youth. Samuel is evidence that we often don’t recognize the voice of God. In the verses of I Samuel, chapter 3, prior to the selected reading, we are told that Samuel was a minister to the Lord. The sons of Eli were priests in the temple. Verse 3 says, “The lamp of God was not yet extinguished, and Samuel was sleeping in the temple of the Lord where the ark of God was…” This was his place when he hears the voice of God — something that had not happened in a long time. God does call Samuel three times before Eli informs his son that it is the Lord calling and how to respond. Samuel does respond and becomes a prophet for the, “Lord was with him not permitting any word of his to be without effect.” I Sam 3:19 I can’t help but think of our own Tabernacle — the place where our consecrated hosts are reserved — and our own burning sanctuary lamp announcing the presence of Jesus in the Tabernacle. I also think of adoration of the Blessed Sacrament, where the consecrated host is exposed in the monstrance. This is a wonderful place to hear God speaking to us. Samuel found his vocation — his purpose — while keeping vigil in the temple. We too can find purpose through quiet time and prayer before the presence of Jesus. The second reading pleads with us to understand that our bodies are members of Christ. We are to see ourselves as a temple of the Holy Spirit. When you think about it, God has gone to great trouble to bring his divine son into the world. On December 8th, we celebrated the Immaculate Conception — Mary conceived without sin. From the beginning of Genesis — the fall in the garden — God was making plans. Throughout salvation history, God has gone to great trouble to bring his sinless son to us. Mary’s vocation was a simple “Yes” to God. The Church too has gone to great trouble to bring us Jesus in the consecrated bread and wine. At the first Mass I ever attended, one of the things that impressed and awed me was the reverence in which the altar was prepared — the careful placing of each cup, each linen, the “plate” I now know as the paten. I looked up “Sacred Vessels” on the USCCB web site and yes — the Church goes to great trouble to assure the appropriateness of the vessels that contain the precious Body and Blood of our Lord. Two articles state, “Among the requisites for the celebration of Mass, the sacred vessels are held in special honor, especially the chalice and paten, in which the bread and wine are offered and consecrated, and from which they are consumed. (327.) Sacred vessels are to be made from precious metal. If they are made from metal that rusts or from a metal less precious than gold, then ordinarily they should be gilded on the inside. (328)” The specifications go on for another six points. Are we not more precious than the finest gold? This reading tells us that, “the body is not for immorality, but for the Lord…” We have been purchased at a great, great price — Jesus’ death on the cross. When we process forward to receive the body and blood of our Lord, we are a vessel of great price. God has gone to great trouble and the Church has gone to great trouble — shouldn’t each of us go to great trouble to prepare our own temple of the Holy Spirit. The gospel reading is one of my favorites. On the 3rd Sunday of Advent, we read the beginning of this chapter. The beginning tells of John the Baptist and how he has come to “testify of the light that is to come.” He has to deny being the messiah and isn’t worthy to untie the sandals of the one who is to come. I would’ve loved to have been there when John suddenly pointed to Jesus and said, “Behold, the Lamb of God that takes away the sins of the world.” No evidence is given in John’s Gospel of John the Baptists’ relationship to Jesus as a cousin. We sort of know that Jesus was born and John the Baptist was about 6 months older. Jesus was twelve at the temple teaching — then — ta da — he is 30 years old and ready to begin his ministry. Did Jesus and John see each other at family reunions? What is not known about these years can be as intriguing as the information we do know. The focus of this teaching is that the two disciples heard John’s message and followed Jesus. As members of the body of Christ, we have something to share with others. It is a vocation, a purpose, to spread the Good News of Jesus — invite others to come to our Table. “The Lamb of God” is heard in two important parts of the Mass. At the first Mass I ever attended, I began crying when I heard, “Lamb of God, you take away the sins of the world, have mercy on us….Lamb of God, you take away the sins of the world, have mercy on us….Lamb of God, you take away the sins of the world, grant us peace…” and everyone knelt. Shortly thereafter the priest raises the host and says “This is the Lamb of God who takes away the sins of the world. Happy are those who are called to his supper.” Indeed I am very happy. My Secular Franciscan Fraternity has a Franciscan Crown Rosary prayer apostolate. Every Wednesday night, a few of us meet after Mass in our Blessed Sacrament Chapel. The picture of St. Francis on the left hangs on the center of the back wall and faces the Tabernacle. Last week it started getting dark earlier. The wall behind the Tabernacle is all glass windows. The darker it becomes outside, the more vivid the window reflects back into the room. 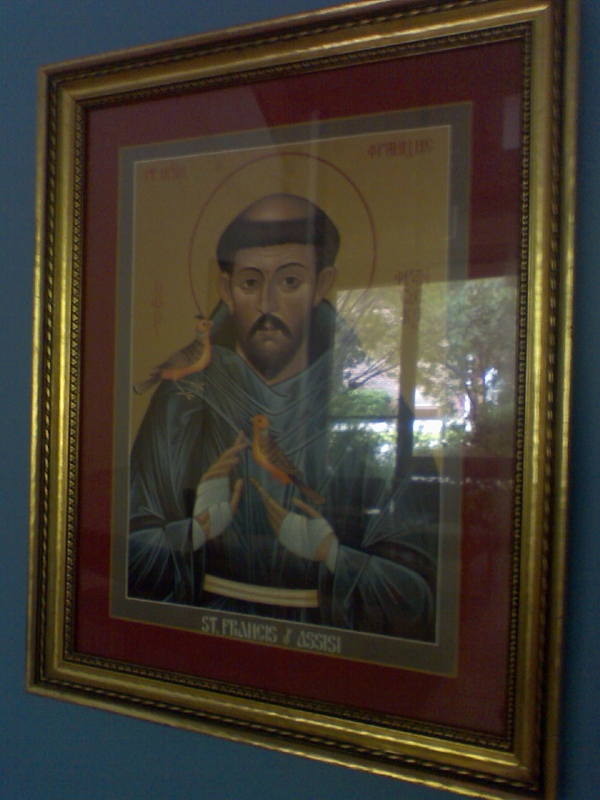 From my seat, I saw that the photo of St. Francis was reflecting back into the chapel from behind the Tabernacle. The reflection was off focus and Francis’ eyes appeared closed. I turned to look over my right shoulder at the wall behind me. The picture is vivid with piercing eyes that seemed to see through me. I turned back to the window and the eyes appeared closed. We continued to recite the Crown Rosary and I began to see Francis’ mouth move. I looked over my shoulder — the vivid image — back to the window — the muted image. Throughout the Crown, it seemed Francis was praying with us. I told my companions once we had completed the Crown. I mentioned it to a few at our fraternity meeting on Saturday. Today, we celebrated the Feast of the Stigmata. The chapel was full for the Crown and I sat on the other side of the room. The sam e thing happened. Maybe the image is all in my mind, but, I had the overwhelming feeling that Francis was praying with us. He is also very happy to be facing the Tabernacle.